Linda McCarthy and Hap Bowditch told the WMAC Monday night dredging of Menantic Creek is a matter of safety. A fast acting crew aboard a South Ferry boat Sunday afternoon averted a crisis when a vehicle belonging to Josh Horton of Horton Dredge & Dock of Greenport caught fire about 2:30 p.m. The ferry was loading in North Haven when Eric Curko, who is a new South Ferry captain just completing his training, smelled smoke. He called Captain Scott Overstreet, who was directing traffic onto the ferry and the two men quickly began backing vehicles off the ferry. They then grabbed fire extinguishers and put out the fire, according to South Ferry CEO Cliff Clark. Captain Mike Scheibel was in charge of the boat at the time, Mr. Clark said. The Sag Harbor Fire Department arrived on site, but by the time they got there, they just needed to check out the truck to confirm that the fire was out, Mr. Clark said. Because of the quick response by the crew members, there were no injuries and no damage to the boat, Mr. Clark said. He noted that crews on both South and North ferries are well trained in how to respond to such emergencies. 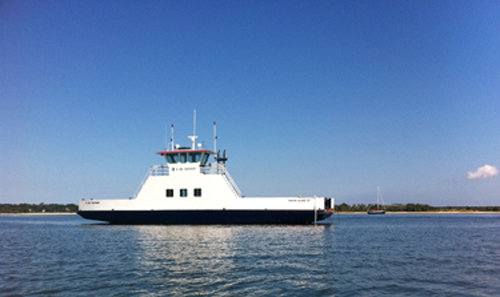 While the boats are certified by the United States Coast Guard, the ferry services have no control over the condition of the vehicles they take aboard, Mr. Clark said. He said his brother, Bill Clark, who was with the United States Coast Guard for 30 years, oversees the training function for his crew members while Captain Mike Mundy, a former member of the Shelter Island Fire Department, is South Ferry’s training officer. “It was a textbook operation by the crew,” Mr. Clark said. Since he got involved with the family company back in 1976, he said there have been a handful of fires, all contained quickly. Mr. Horton wasn’t available for comment.